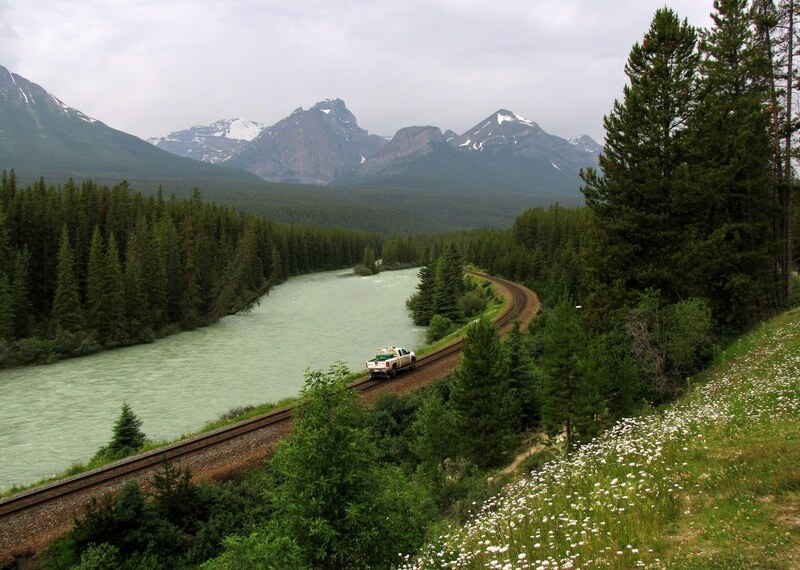 And here's a CN train, at Yellowhead Pass area, taken from high-above from the top of the Jasper Tramway. West portal for Mt. MacDonald tunnel, Rogers Pass. The question is does our fearless Global Moderator have an affinity for the King's English such as Major Rogers had? He was apparently quite eloquent while slogging his way through the devil's club thickets in the Illecillewaet River valley. 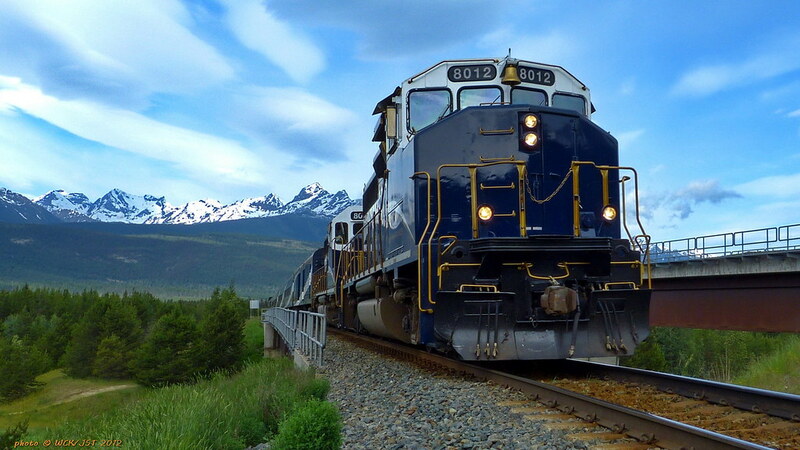 In the background the tall pointy peak on the right is Mt Sir Donald, named for Sir Donald Smith (later Lord Strathcona), the guy who drove the CPR's last spike, and gave his name to Vancouver Island's largest provincial park. The track behind is indeed the Connaught track leading east and uphill to Glacier Station and the east portal of the Connaught Tunnel. The name 'Connaught', BTW, commemorated the Duke of Connaught, one of Queen Victoria's progeny, who served as Canada's Governor General at the time this tunnel was built. 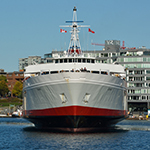 His name also graces the BC Legislative Building Library in Victoria, and the old Cambie St. bridge in Vancouver was officially named after him. 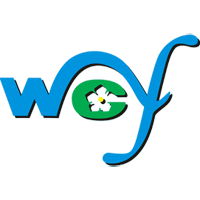 Lastly, Mr. Fluge, next time you go out on one of the railway historical trips check with me and I will tell you what to look for and where to turn off the highway. 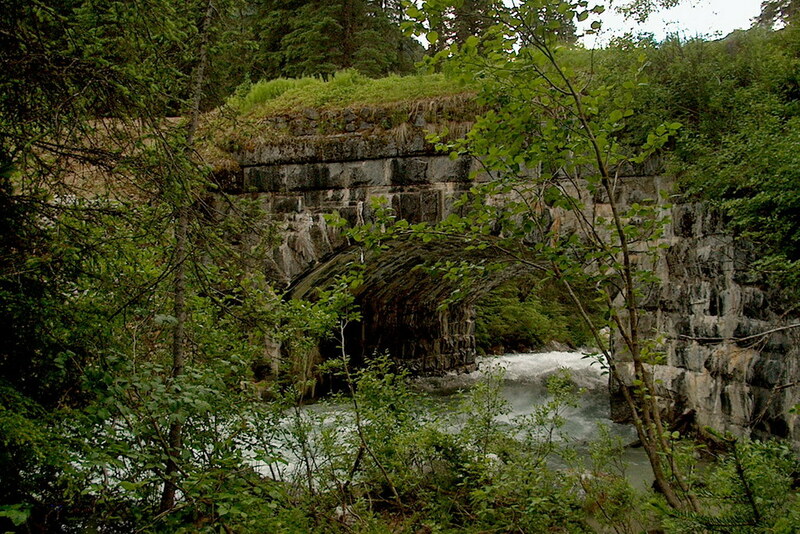 Also look for me to do another entry on the old Kicking Horse bridge on the 'Bridge' thread. Mr. Wet Coast Kid, thanks a bunch for the info and confirmation of the Connaught track. That famous Connaught name is also used for the main street in the town of Jasper. Re Major Rogers' speech abilities, no I don't have his special giftings. I did enjoy reading about him though, in Pierre Berton's "The Last Spike" book. I'm now part-way into Robert Turner's railway history book (West of the Great Divide) and am enjoying that book too. The quick replacement of the many temporary wooden bridges and other structures is fascinating to me. 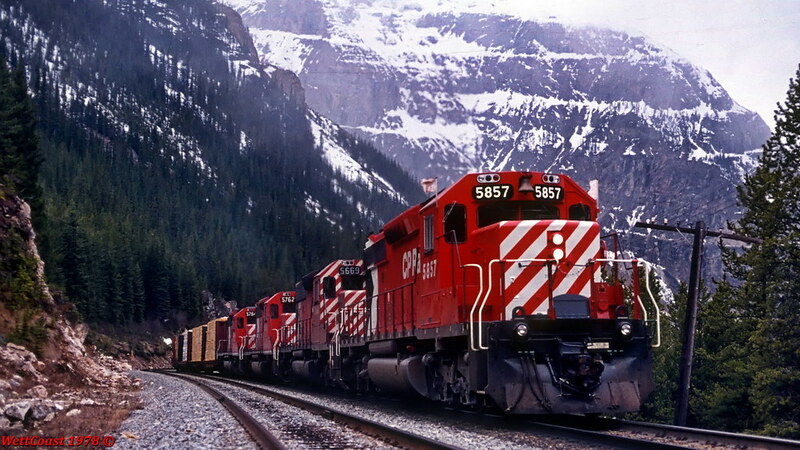 I am building up a new list of railway things to see, next time that I travel through those mountains. And yes, I'll ask you for advice on other treasures to look for. 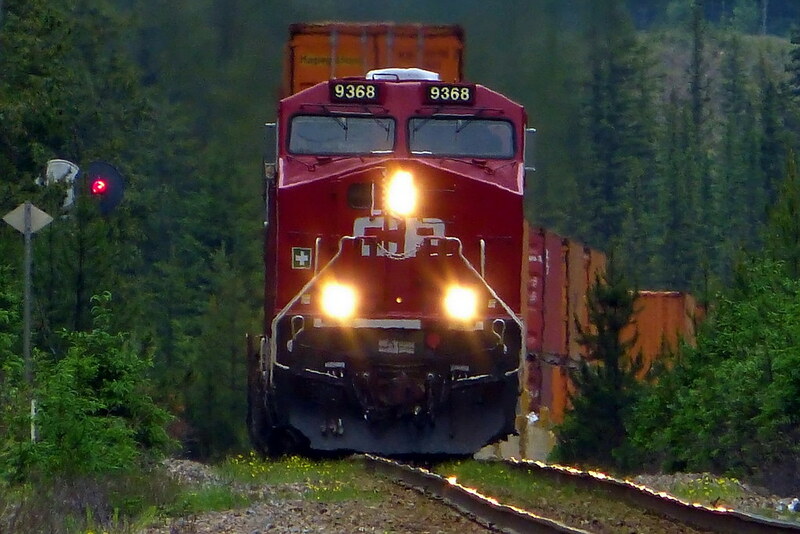 But for this recent trip, I knew about Morant's Curve thanks to your posting about it on this forum....so thanks. Persephone and I took a road trip out to Canmore to pick up a trailer load of stuff, and on the way got a few rail photos including a stop at "the last spike" in Craigellachie. 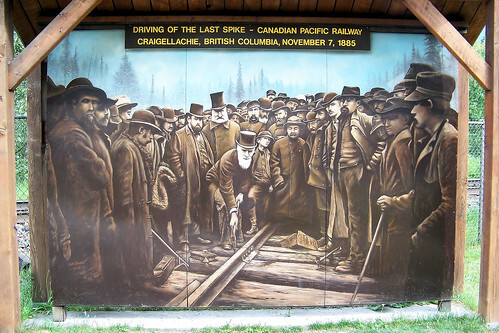 Mural of the driving of the CPR last spike, November 7, 1885 in Craigellachie BC. Is that piece of track identified as original? The rail is of the right vintage. 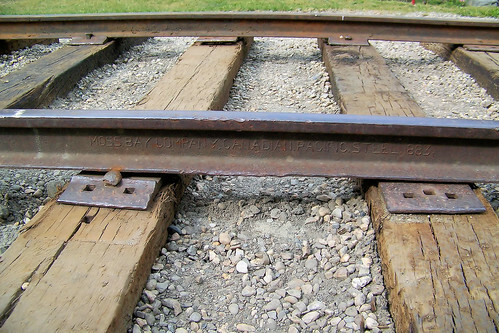 However, at the time of construction the plates that go between rail and tie were not used. 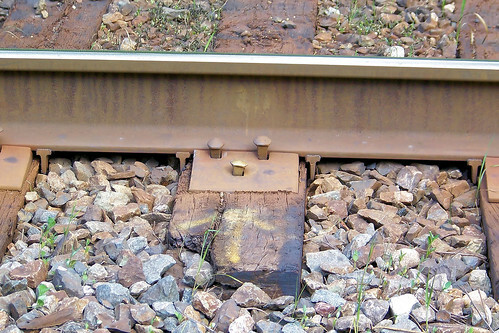 The rail was spiked directly to the tie. As for the telegraph lines they are no where near original either. 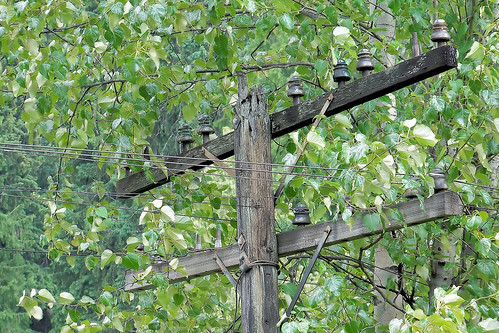 The original poles supported just one pair of telegraph wires in 1885. 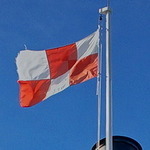 The lines shown were in use until just a few years ago. Some may still be in use although they look rather neglected. I expect today that communication (including fibre optic cable), power & control cables are buried beside the right-of-way. Sometimes you can see these cables fastened to bridge works where there is no ground to bury them in. I will scan an 1885 'last spike' photo and display it here later. 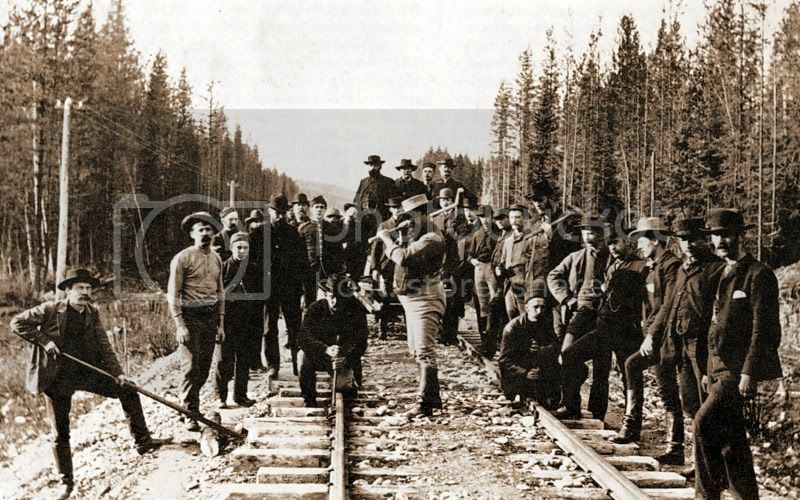 CPR Construction Workers' version of the 'Last Spike' - Craigellachie, BC - 7 Nov 1885. Note the track bed & telegraph poles. Is that piece of track identified as original? One of the volunteers did identify it as original track, but i suspect the plates are not. That would make much more sense. I just love the glass insulators. I collect them whenever i find them at garage sales and flea markets. I'm reading through that book right now. I've previous read the books "The National Dream" and "The Last Spike", but this book is interesting for the photographs and maps. The book has a 2 photos of the official last-spike ceremony. In one picture, Major Rogers is hidden. In the other picture, his whiskers are visible. Not something I had marked on the calendar, (Obviously I had no idea.) 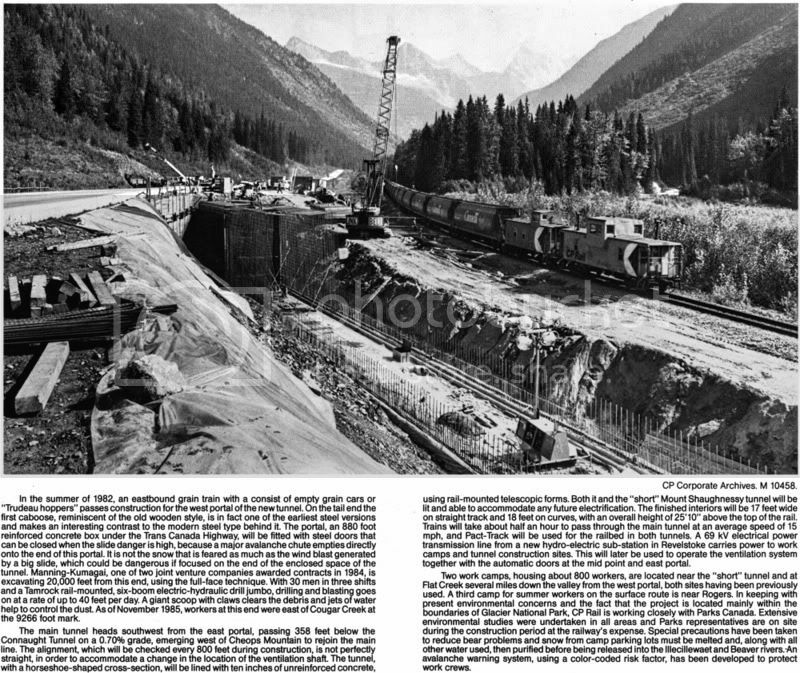 but I just ran across a blog entry/webarticle on the 100th anniversary of the completion of the CPRs Spiral Tunnels in Rogers Pass which, apparently, opened in October 1909, just over a hundred years ago as of today. The first train rolled through the Spiral Tunnels on 1 September 1909. They are located just west of Kicking Horse Pass, not Rogers. This past September also marked the centennial of the discovery nearby of the Burgess Shale. More info on both events is linked below. Pretty neat old documentary about the CPR in the Rocky Mountains during the 1950s which was forwarded to me by a family member. I got the same video emailed to me by a family friend. Haven't had time to watch the whole video, yet, but I like the predictable and classic image of the heroic engineer with his pipe in his teeth, and his hand on the whistle chord . I also just wanted to post a like to an absolutely spectacular photo (in my opinion). This is photo taken by a railfan up at Camp A on Canfor's Englewood logging railway just before their winter shutdown last fall. 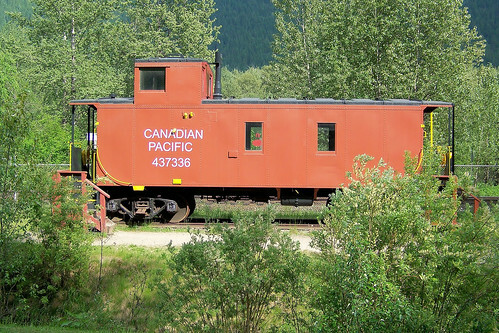 A locomotive used in the building of the Spiral Tunnels still exists, abandoned near Field BC. This bridge was built in about 1895. 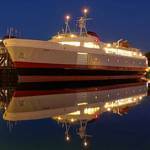 It replaced an original timber structure constructed ten years earlier. This bridge remained in use by the railway until late in 1916 when the nearby Connaught Tunnel under Rogers Pass was opened. The bridge supported both the main line and a passing track. Today there is a gravel road on the bridge deck which leads to the site of the CPR's one-time hotel that was known as Glacier House (torn down in 1929). Many good hiking & mountaineering 'approach' trails were developed in the area around Glacier House. One of those trails is a short walk called the 'Meeting of the Waters' trail which leads to good views of this bridge. 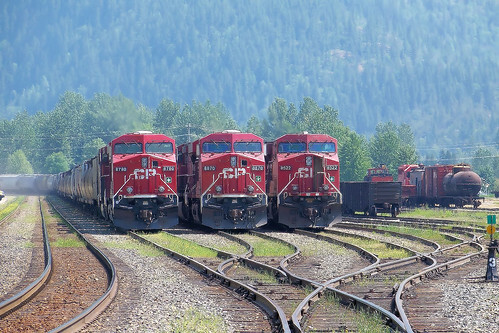 This is a must-see spot for those interested in the railway history of Rogers Pass. Duly noted for my summer trip, thank you. That bridge, and the other stone bridge on the east-side of the pass (the bridge that's visible from the highway) are on my list of things to see in 2012. *BTW, my son Ben did well, taking more than a minute off his own Canadian record for junior men in the 10 km distance. Though he is not going to the upcoming Olympics, he is going to Barcelona, Spain, to compete at the World Junior T&F Championships. His parents will be at that event. I visited Morant's Curve 3 times in the past few days. On today's visit, I saw no trains. Upper spiral-tunnel at big-hill in Yoho Park, along CPR line. - seen from the viewpoint on Yoho Valley Rd. - July 12, 2012, early afternoon. Did you do the big hill hike from the Yoho Camp ground to the old Big Hill grade when you were there? Its a steep hike but a good one and you can see the remains of one of the old narrow gauge steamers used to build the right of way for the spirals. Yes, but it was only a portion, by chance. I did part of it, by mistake. I had parked on the side of Hwy-1 and was looking for Cathedral siding. I climbed up a steep short trail and found the wrecked locomotive and the safety-spur #3. Both had interpretive-trail sign #s on them. - I will post photos in a few days, as I work through the days of my trip. Notch Hill grade reduction diversion track, near Tappen BC (near Shuswap Lake), seen on July 9, 2012. - We arrived just in time to see a coal train westbound through this 1980's diversion track. 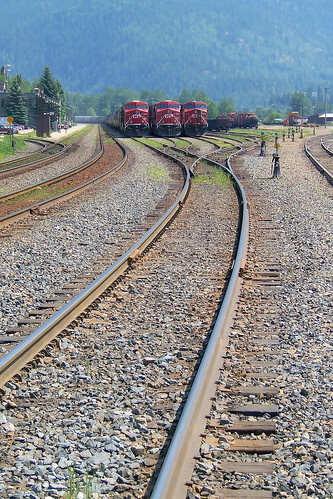 It's a loop in a field, that allows the route to gain elevation slowly for the heavy westbound trains. - The starting part goes under the auto-road in a culvert, and the ending goes over the auto-road on a bridge; hence the elevation gain. VIDEO of the train going through the diversion. (sorry, I missed the part where the train starts by going through the culvert under the road). CP 9821 Builder GE Model AC4400CW HP 4400 Built: May 2004.